MERU is a small charity that offers an individual design and manufacturing service of disability products for children and young disabled people when no other product exists to meet their needs. They make modifications to existing disability products and repair damaged equipment, as well as custom-designing and manufacturing new and complex items. 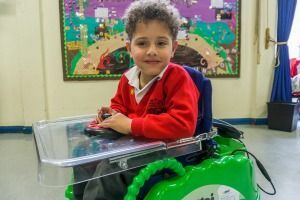 The award-winning MERU Bugzi is a powered indoor wheelchair for children aged two to five and offers a unique opportunity for pre-school children with disabilities to experience independent mobility, often for the first time in their lives. Bugzi is offered on a loan basis free of charge to the child and their family for the duration of their need. The Wisley Foundation has provided funds in 2018 for the delivery of a new Bugzi wheelchair. Thank you so much for supporting MERU and our Bugzi wheelchair scheme once again. Being able to provide a Bugzi, free of charge, giving a child the opportunity to experience independent movement for the first time is so exciting.